If you’re like most of us, your microwave oven serves two main duties: boiling water and reheating leftovers. But wouldn’t it be great if rather than just taking up a chunk of space in your kitchen, you could actually rely on your microwave for cooking meals? Cooking food successfully in a microwave is challenging because the magnetron, the element that cooks the food in most microwaves, can only deliver full power. Even when set to “50% power”, the microwave oven is actually going through cycles of delivering 100% power, followed by a period of no power. Imagine if your regular oven worked this way! Instead of cooking a roast at 350 degrees, you’d cook it at 700 degrees for ten minutes, then take it out for ten minutes, and repeat over and over again until the meat is cooked. Good luck with that! Panasonic and GE have microwave ovens on the market with something they call “inverter” technology, which aims to solve this problem. The inverter modulates the level of energy being transmitted by the oven to achieve a consistent level. So when you set 50% power, for example, you actually get a steady stream of 50% power for the entire cooking time. The result is more evenly cooked food, defrosting without cooked edges, and even the ability to keep foods warm until mealtime. 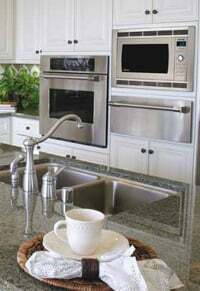 Update 6/13/13: Whirlpool AccuWave and KitchenAid Optimawave ovens use the same technology. We spent a few weeks with Panasonic’s NN-SD688S, a 1.2 cubic foot counter top model with 1300 watts, to see how it worked out. Using recipes from Panasonic’s site, including some produced by the prestigious Culinary Institute of America specifically for inverter microwaves, we made hollandaise sauce, fruit crisp, corn chowder, barbecued pulled pork and some other fun dishes. What we found was that the microwave inverter performed surprisingly well for dishes that required slow cooking in moist environments, such as the hollandaise sauce (which can be tricky to do on the stove top) and pulled pork. Corn chowder worked fine as well, though it would have been just as easy on the stovetop and we didn’t like moving large bowls of boiling liquid in and out of the oven. Perhaps not surprisingly, the fruit crisp was a flop, with a soggy, raw-tasting topping and overcooked fruit underneath. Based on our experiences, we could easily see using an inverter microwave in addition to our standard cooktop and range, especially during busy holiday times when we are trying to cook many dishes at once, while also keeping everything warm until serving time. It is a fast and clean way to steam vegetables, melt chocolate, braise meats or do any one of a number of occasional kitchen tasks that involve steady cooking and do not require browning. So if you are purchasing a microwave, we recommend that you give inverter models strong consideration. All Panasonic models also recently received the Good Housekeeping Seal, which provides a two-year limited warranty against defects. UPDATE 6/24/17: With Whirlpool and KitchenAid no longer making inverter models, Panasonic is the remaining brand of choice for this technology. 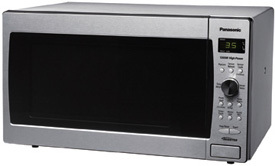 The Panasonic NN-SD945S was our recent winner in our Best Microwave Oven review. Read the article to find out why and learn about our opinion on whether Panasonic's new "cyclonic wave" inverter oven technology is worth the extra cost. Our experiment with microwave recipes, even those written specifically for Panasonic inverters, clearly revealed another long-standing design flaw with all microwave ovens. It turned our initial attempt at crumbled bacon for the corn chowder into charcoal, and curdled our first run of hollandaise. The culprit is the nonsensical decision to use a scale of “1” to “10” to set the power level, rather than setting a specific wattage. This abstract power scale becomes a significant issue with microwave recipes because it requires the cookbook author to assume a certain wattage in developing the recipe (often 800 watts, sometimes not). However, microwave ovens vary significantly in wattage, from around 700 watts to about 1400 watts. So a 700-watt oven will take approximately twice as long on “High” as a 1400-watt one to provide the same amount of cooking. To compensate, the cook needs to convert those times for her own oven based on its wattage. The solution to this is simple, however, and just requires one manufacturer to make the common-sense leap forward to allow all of their ovens to be set based on wattage delivered. This is the same logic that allows us to set our regular gas and electric ovens to 325 degrees, not “60% of the way around the blank dial”. Microwave recipes could then be written as “cook at 800 watts for five minutes”, which would be easy for a cook to apply for any oven from any brand. It’s interesting to read your open call to manufacturers. I was just staying in Paris and we had a Siemens microwave with a 700 / 1400 watts switch on it. We also noticed that the microwave recipes on the packaged foods described the cook times along the lines you suggest, e.g., cook at 700 watts for 10 minutes. The hardest thing for me, in seeing this for the first time, was the unfamiliarity with concept (watts as a measure) and the the numbers. I am used to thinking about cooking at, say, 350 degrees, but it was strange / unfamiliar to think about cooking at 700 watts. Obviously, if there’s a lot of uniformity around 700 / 1400 watts in both the microwaves and the recipe descriptions, we’ll all get used to it—and it’ll be great to NOT have to always guess which end of the spectrum one’s microwave is on, when a recipe calls for say “10-15 minutes” of cook time. Why, oh why is it necessary to press the “Power Level” button nine times to reach the lowest level on Panasonic ovens? When a user bothers to change the power level at all, it’s usually to set a much lower than full-power setting — like 10-20% for softening butter or gentle warming. Other (non-inverter) brands with numeric pads or rotary dials allow quick direct entry of the desired power level. But 90% of the time, I must press a button 9 times (or 18, if I overshoot) to reach 10% level on my otherwise wonderful inverter Panasonic MW. Thanks, Jay. I wasn’t aware they already do that in Europe. Knowing that reinforces the notion that there is no technical hurdle preventing manufacturers from implementing it in the U.S.
As a cook (the best one in the world, according to my kids), using wattage as a measure is much more natural for me than an arbitrary 1-10 scale. Panasonic would also have a real advantage here because their inverter technology should allow you to get consistent delivery of any wattage level from 100-1400 watts. Other manufacturers may have less flexibility because the magnetrons can only control power through cycling on and off - you could get an average wattage delivery through cycling, but not a consistent level. Still, much better than what we have now. Great article about microwave inverters. I have been looking at buying a new microwave ovwen and came across this new inverter technology and it all sounds quite good. I’m surprised i have only seen a few microwaves using this technology… such as Panasonic. I noticed you mentioned Panasonic a few times in your blog post. Are their any other Microwave makes/models you would specifically recommend or is the Panasonic one probably the best on the market at the moment? And finally I noticed this article was done a while ago so are they any new developments on this kind of technology? Panasonic holds the patent on inverter technology and the only manufacturers that have it, to our knowledge, are Panasonic and GE (which licenses it from Panasonic). The inverter technology has actually been around for a long time. We wrote about it because so few consumers are aware of it and we think more should be, given its inherent cooking advantages. I would love to see new development around the idea I suggest in the article to allow microwaves to be programmed by wattage, rather than the arbitrary 1-10 power. That could truly transform microwave cooking (for inverter and non-inverter models) by bringing consistency and simplicity for recipes and ovens. What’s your current preference between “True Cook Plus” on Kenmore and LG VS “Inverter Technology” on Panasonic and GE? I am in the market to buy one now and am leaning towards Inverter Technology because of defrosting. Most times I defrost meats or fish the edges cook and it messes up the food. I LOVE your thoughts on your post “an open call to Manufacturers” re: watts vs power 1-10. I wish all 3 ideas could be incorporated into ONE microwave! It would make life so much simpler with optimum cooking results. Now if we could only get these products made in the USA, I would be really happy and gladly pay more. Hi Janet, Glad you enjoyed te article! The two technologies are really very different. TrueCookPlus is mostly helpful for prepackaged foods that have the TrueCookPlus label. It ensures proper reheating by automatically setting the time and power level for whatever wattage oven you have. However the underlying cooking technology is the same as a “normal” microwave - the oven cycles on and off at full power. Inverter technology gives much more flexibility both for reheating and for actual cooking because it allows you to produce consistent low level power, when needed. And it doesn’t require a TrueCook label, obviously, so it makes it easier to cook any food, not just Lean Cuisines. So my preference is definitely towards the inverter technology. BTW, a great kitchen tip I use when in a rush is to defrost my meats in a pot of luke warm (not hot) water. Refresh the water if it gets too cold. Works super fast (thanks to the greatly increased surface area contact versus defrosting in air) and there is no risk of cooked edges as you have with the microwave. Place in a ziplocm if necessary, and press out the air to make sure you have contact with the water. I have purchased the inverter microwave however I cannot find any receipes or cook books using that style of preparing food. You can find recipes on Panasonic’s site that were created by the Culinary Institute of America for the inverter microwaves. I’ve seen this technology incorporated in KitchenAid microwaves long before Panasonic. They named it OptimaWave, which enabled them to extract a premium for their microwaves for a long time. More recently, Panasonic ran with it in a big way, and refer to the inverter which is the enabling mechanism. Since Panasonic cannot protect the process, they may make the internal components of certain GE ovens that employ it, or have related process patent. Its history has been somewhat like the CVT transmission in cars. It’s the perfect concept. It has been around for a long time. Getting reliability on par with conventional methods have so far proven to be elusive. If you are offered an extended warranty, take it. The things that go bad are the inverter board, the microprocessor board that controls it, and as always, the magnetron. Just having the magnetron covered does a lot less for you in this case. The one I had with the best track record went 4 1/2 years without issue. Even so, it’s really the only kind you can do a decent job of cooking with. If you are always-on-high-guy making coffee and popcorn, don’t even think about an inverter-based microwave. I LOVE your idea of standardizing power levels. There are variations in wave guide efficiencies, stirrer mechanisms, etc., so even if watts is not exactly the answer, some verifiable standard that measures cooking power would be perfect! The benefit to the industry and consumer would be huge. Thanks, Jack, for the feedback. Thanks, Jack, for the feedback. I wasn’t aware of the Whirlpool technology, but was familiar was some complaints about the reliability of the inverter boards. I felt comfortable recommending the Panasonic because they had secured the Good Housekeeping Seal of Approval, which automatically extends the warranty to two years. PS: Whirlpool purchased KitchenAid, and have since used the same internal components in their microwaves except they call it AccuWave. The KitchenAid retains the high-end construction, user interface, and microprocessor-based cooking features. However, it also has the same reliability issues that plague the technology. Microwave broke. Bought new one. Made popcorn in Presto popcorn bowl. It took 7 minutes to pop. Scary! Talked to Panasonic and Presto. Someone finally told me the Presto bowl won’t work in the inverter microwave. AACCHH! We bought the inverter by accident. So bought a Progressive popcorn bowl and set it for 3 minutes (max suggested). Only popped half the kernals. Not being able to pop popcorn in a bowl in the microwave is unacceptable. So I went looking for a solution online. Here it is: http://www.cgwerks.com/steveblog/2010/02/04/healthy-economical-environmentally-friendly-microwave-popcorn/ I ordered a Pampered Chef Classic Batter Bowl. My husband thinks the inverter microwave needs the oil to pop the popcorn correctly. I’m hoping. I’m unclear why your microwave wouldn’t be able to pop popcorn unless it was defective. The microwaves coming from an inverter-based microwave are no different than in a standard microwave, it’s simply a different way of controlling the amount of power. An inverter on “high” should work the same as a regular microwave on “high”, with both kicking out continuous full power - oil or not. Have you tried heating other items - e.g. a glass of water - in your microwave to see if they get hot quickly? If not, I would return the microwave and get a new one. If they do, then I would try a higher setting on your microwave with the popcorn bowls (watching carefully to ensure things don’t get burned). I would suggest you to have your popcorn tested in some lab. Though the spec says it is convection oven but it has no rear fan or visible heating element. Even not on the top or bottom of the oven cavity. So I am puzzled how does this achieve the convection without a fan or a heating element. Another question is about the recipes from Panasonic site. In those recipes all are cooked with only microwave option. So is the inverter microwave of Panasonic is a substitute of convection. I don’t know specifically for that model. However, it is listed as having a 1515W convection heater, so I assume there is a heating element hidden behind the interior walls so it doesn’t interfere with the microwave function. An inverter microwave is not a substitute for a convection oven. Both can heat food quickly, but anything you want browned, especially bread products, will not work well in a microwave. And some jobs that work well in the microwave, such as melting chocolate or heating soup, are not appropriate for a convection oven. Hello, My Panasonic Inverter Microwave seems to be choosy about what it will and won’t cook. It heats water in a mug well. It has cooked scrambled eggs, but I put a bowl of rice in the oven on high and after two attempts at cooking it for 15 minutes each on high, I was left with lukewarm water and raw rice. I tried cooking a cob of corn in the husk which had worked in a different microwave. This one after 6 minutes on high was cool and raw. Any thoughts? Thanks, I’ll do that. I appreciate your quick reply. The purchaser feedback on Panasonic on Amazon is incredibly miserable, so poor that I won’t honor them with a purchase. I was looking to replace my 14 year old Kenmore microwave with something fresher looking. The one feature I had to have was the Ultra Wave inverter. I don’t enjoy splattered/mess and unevenly cooked food. Go to the various appliance stores and no one knows what I’m talking about. Scour the internet and all I can find is countertop units with this feature. Alas, Jack mentions Whirlpool sells it as AccuWave and my search is soon to be over. Thanks for a great article as well, Josh. I wish that cooking evenly would be something the manufactures wrapped there arms around. Inverter microwaves are no different than standard microwaves in terms of radiation. The only difference is that inverter microwaves have a circuit board that controls the amount of power delivered so you get more even heating. As an aside, there is a lot of confusion and misinformation about microwave “radiation”. Microwaves emit “non-ionizing” radiation, which is generally harmless. Radio waves, heat energy and even visible light waves are all examples of non-ionizing radiation. “Ionizing” radiation can be very harmful, as it can directly damage the DNA of living organisms. X-rays, gamma rays etc. are examples of ionizing radiation. Ionizing radiation exists naturally in the universe, and is also produced through nuclear reactions and emitted from radioactive materials, such as plutonium. Here’s a little trivia bonus for you. Ever wonder why the microwaves don’t fry your head when you’re looking through the window at food cooking? Microwaves have a large wavelength (usually measured in inches for commercial microwave ovens). The perforations in the metal mesh on the door are far smaller (a few millimeters). So microwaves can’t escape, while much smaller visible light waves can. Great information and going out to buy an inverter microwave soon. Thanks. Thanks for letting us know. We’ve updated the link. I am looking for detail about Inverter Technology in microwave and found in top search. Thanks for your sharing. This technology help more future and new product launch in future. My MW just died. I have an older toaster oven, which is on its’ last legs but is great for broiling small fillets of red meat, or fish, or a chicken breast and it toasts 2 pieces. Throw some veggies with rice in the MW and dinner for 2 is a wiz. I have not used the oven in my range for quite a while and I like it that way. Great storage. So, is there one unit that can do the combined functions I need? Roast my meats, make my toast and boil water for our tea along with the other quick things I use the MW for? It would be generous to describe my kitchen as “small.” We love our small, vintage cottage but a challenge for space. Living with a NYC kitchen, I feel your pain. There are ovens that combine microwave functionality with a convection oven (http://www.sears.com/kenmore-elite-1.5-cu-ft-countertop-microwave-w/p-02075153000P), and GE’s Advantium line has some very fancy cooking technology if you’re willing to plunk down over a grand. But none of these ovens can toast. A few years back LG did make a true Microwave/Toaster oven, but it was a somewhat ridiculous contraption and is no longer made. One great benefit of thee inverter technology is the ability to cook beans at a lower power level so they won’t explode. My sister has a new lnverter and found out she can’t boil coffee in a mug is this true? A microwave that uses an inverter is no different than a standard microwave, except that it can control the intensity of the microwaves delivered. So it can heat coffee in a mug the same way any other microwave can. If the coffee is not getting hot, it could be that there is a problem with her microwave. Or, if she is using the automatic heat mode, it may be turning off when it senses the coffee is hot but before it has started boiling (you wouldn’t really want “boiling” coffee anyhow, as that’s too hot for serving beverages). I have had my Panasonic Inverter MW for about 2 1/2 years. LOVE IT. At power level 1 I can soften a stick of FROZEN butter without it turning liquid in spots. I can boil water for TEA, but I only heat my COFFEE water to about 175 degrees F. You should never use BOILING water for coffee as that over-cooks it. I fix canned soup, chili, refried beans, etc at level 2. It takes longer, but it does not burn product around the edges like it does at higher power. I have even heated 3 quarts of water to a ROLLING BOIL in the biggest bowl I could get into the MW. If or when it dies, I will replace it with another Inverter MW within 24 hours!!!! If you go to your specific model microwave on the Panasonic site, there is a tab for owner’s manual. For products no longer sold, you can try searching the Panasonic site or check out Retrevo.com. My Whirlpool, Over-the-Range, Accuwave microwave has stop heating all foods (8 years old, light use). Otherwise, it runs the same. Do you think it will be easy to fix or even worth fixing? Just read the reviews of that Panasonic model on Amazon. They are fraught with problems, specifically the door latches go bad and the units emit RADIATION. No thank you! I’ll pass on the Panasonic models. Some of the Panasonic models have had issues with their door latches. But I have seen no reports that they emit radiation outside the units. Of course they emit radiation WITHIN the unit, because that’s how microwaves work. It would seem extremely unlikely, given how microwaves are constructed and the nature of the microwaves themselves that any meaningful level of (or any) radiation would be able to escape from any consumer microwave. I’m confident that you knew EXACTLY what I meant by my statement! The context alone told you that I meant OUTSIDE the unit. Inside the unit would NOT be an issue! And YES, it IS a problem as they do LEAK radiation once the latch has been compromised. I just got a 2010 Panasonic (NN-SN797S) for free from a friend to replace an 2009 Oster microwave that had inexplicably stopped heating last weekend. Thanks for explaining the inverter technology, that’s exactly what I came here to find out. One thing that struck me about the Panasonic is that it is much lighter despite being bigger and more powerful. Makes me suspicious of the build quality (more plastic?). I’m also impressed that you’re keeping this entry up to date 6 years after writing it. Thanks again. Wow, I didn’t realize it had been that long until you pointed it out…A lot of people come to this article to learn about the inverters, and 90% of it is still as relevant as the day I wrote it, so I try to keep that other 10% current. I’m afraid I’m not enough of an expert in microwave internal parts to answer your question about the weight, though. If i had to guess, I would assume that it’s the heating components (magnetron, power supply, something else) that weighs less for inverter ovens, rather than being more plastic. The Panasonic inverter technology is about the power supply. 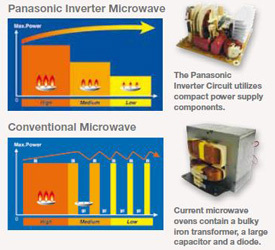 Instead of a heavy transformer-based power supply (providing a single setting of power), the Panasonic uses an inverter which can provide multiple levels of power to the microwave generator (the magnetron). The inverter is smaller and weighs less, so Panasonic benefits from more interior per exterior size and lighter weight (by a noticeable amount). Thank You for the informative artical explaining Inverter Technology. Although the artical is several years old, the information is still relevant. As more and more manufactures are using the technology. I just purchased a Frigidaire 1.6-cuft 1.100 watt. Counter top model FFMO1611LB At Lowe’s. Glad you found the article useful. I looked through Frigidaire’s site and I don’t see anything that would suggest they are using inverters in their microwaves. Did you see something that suggests otherwise? I can’t find any references to any Frigidaire models using ever using inverter technology. I called Frigidaire technical support and they confirmed that no Frigidaire models use an inverter. However, the model you listed is a pretty old model and it’s possible they may have had it at some point. It should be easy enough to tell when running it. With normal microwaves, if you set it for 30% power, you will hear the magnetron cycle on and off every 15 seconds or so. With an inverter, there will be no cycling, power will be continuous. Give it a test and let me know what you discover. I will test it. How ever there will be a delay. The delivery date is July 3rd. Thanks for your research, I canceled the order at Lowe’s, because the oven did not have the Inverter Technology and the long delivery time. Went to Amazon, looked up Panasonic and placed an order for a NN-SN733B. At 1250 watt’s this is the highest powered I have seen for a 1.6 cu ft microwave oven.